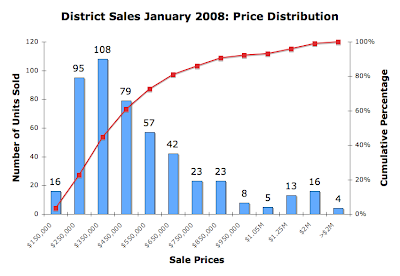 I've finished my analysis of full value residential sales the District recorded in January 2008. It continues to be ugly out there. Yes, aggregate average prices are up, but that's a surface story sufficient only for those who can't be bothered to peel the onion and prefer to believe hoohah. In the reality based world, sales volume in the District is way down, condo prices are flat, and single family home prices continue to appreciate despite falling sales volume. One data point I noticed in January's data was the increased number of homes purchased by banks, presumably foreclosed. 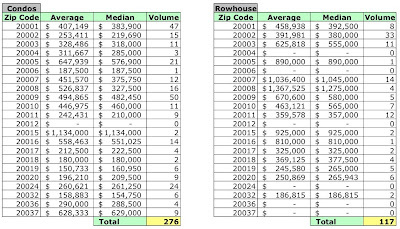 In January 2008 the District recorded 489 residential sales, 22.75% less than the same month in 2007. Dollar volume fell, too. "Fell" may not be strong enough. Collapsed? Surrendered? Capitulated? All but two wards had lower sales volume. 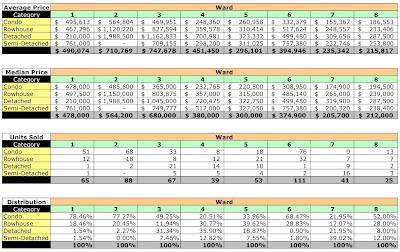 Wards 1, 2, and 8 had positive growth in prices; Wards 5 and 6 were negative; Wards 3, 4, and 7 split the difference. Condo-dependent Ward 2 had the steepest drop in sales volume, down 53.19%; the "invisible hand" continues to slap that ward around. Condo sales continue to dominate Wards 1 and 2. In Ward 1, 79.35% of sales were condos and in Ward 2, 61.4%. More than half of the District's semi-detached home sales were recorded in Ward 3, 53.65%. The chart below shows the distribution of January's recorded sales by sales price. In the aggregate, average prices were up 5.43% while median prices were relatively flat, falling 0.05%. Sales volume continued its downward spiral, falling 22.75%; condos fell 25.2% and homes declined 19.32%. Overall demand for single family housing is down 30.94%. Average prices were up 7.97% and median prices were up 7.25%. All categories of houses had declining sales volume, down 16.28 - 24.05%. Once again, Ward 3 has the honor of having the highest average and median prices in the District. I continue to believe the high end homes - those costing more than $1MM - are skewing the results. The data show that the average sales price for a District home was $571,458 in January. Of 213 homes sold, 27 sold for more than $1MM for a total dollar volume of $40,343,953; all but two were in Wards 2 and 3. In other words, 12.68% of January's recorded homes sales accounted for 33% of the dollar volume. 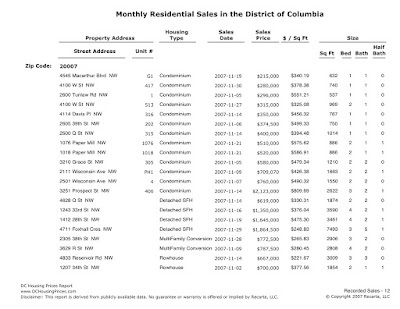 Excluding these homes, the average home price in the District is $437,455, about 25% less. If I were inclined to be even more left brained, I'd say that excluding these 27 homes would reduce the District's aggregate average sales price to $424,949 vice $484,009. Which is why I called it hoohah. 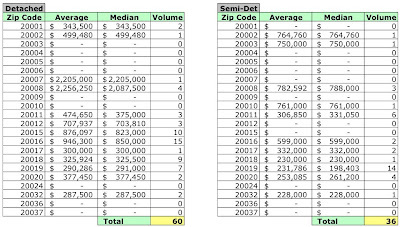 January 2008 average and median sales prices and unit volume by zip code. 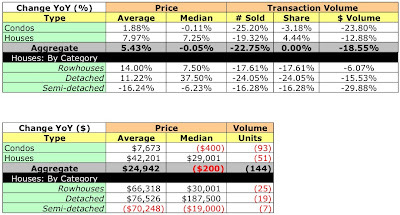 January average and median sales prices and unit volume by ward. I just returned from Woodbridge visiting family. There is devastation is prices out there. Near Dale City Blvd I saw homes that sold for >400k two years ago being auctioned starting for 50k. These are really crap homes that never should have sold for more than 100k at most. The DCHousingPrices IT department has asked me to ask you which browser and operating system you're using. Please reply to me via email. Thanks.